Each week, I am more excited about Delta Sigma Theta 5K Run/Walk on June 23. 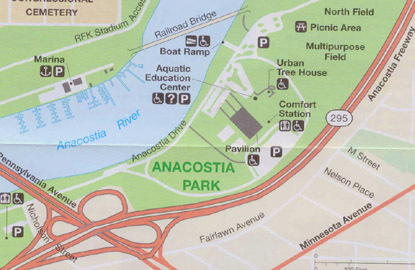 This week I’m pumped about the location in Anacostia Waterfront Park. Highly-accessible and just blocks from our new location on Good Hope Road, the park has the potential to serve our clients, staff and volunteers. I hope it will become a transit route, a gathering place, and (of course) a space where our clients will walk, jog, or bike for their own health, relaxation, and enjoyment. But first, it will be the site of our race! As part of extensive renovations to the waterfront, the Anacostia Riverwalk Trail has undergone extensive construction in recent years. It will soon offer 20 miles of paved trails running from Maine Avenue at the Tidal Basin to Kenilworth Gardens. The new 11th Street Bridge will have a wider footpath for bikes and pedestrians, and connects Anacostia with the Yards Park and other development just across the river. On the eastern banks, the trail currently runs to South Capitol Street, a smooth stretch of fresh pavement surrounded by thick grass and greenery. Don’t forget your caps, sunglasses and a camera! This quiet oasis is a wonderful location for a 5K and an opportunity to connect with our new neighborhood as our move date approaches. Cross the river by foot, bike, car, or bus and meet us at 1900 Anacostia Drive SE by 9:00 a.m. on Saturday June 23. Celebrate your finish with your friends and fellow Calvary supporters, then take a peek at the new Calvary site at 1217 Good Hope Road SE. Pack a swimsuit and spend the afternoon at the Anacostia Pool (1800 Anacostia Dr. SE) or grab lunch at Uniontown Bar & Grill (2200 Martin Luther King Ave S.E.). Have you seen the Big Chair or the Frederick Douglass House? Take a little time to get to know the neighborhood and you’ll see why we are so excited to bring Calvary’s programs to this vibrant neighborhood.